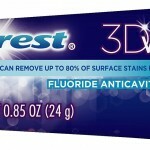 The first time I used Crest 3D whitening toothpaste, I had an instantaneous sensitivity to it. It felt so uncomfortable and the sensation lasted intermittently for a few days. By the following days, I mostly experienced this sensitivity during brushing. Eating and drinking were fine for me. I would describe it best as a “raw,” “nerve,” or cold achy feeling. I waited until a month later to give this toothpaste another try before deciding to give it away or dispose of it; brave or stupid as that may seem. To my surprise, I never experienced any sensitivity to this product since my first try. I don’t have any plausible explanation for this except that the menstrual cycle/hormone levels have been known to cause temporary gum sensitivity. I do have a long-standing habit of loading my toothbrush with lots of toothpaste. Perhaps by cutting back on the amount of toothpaste I use per brushing, this has also helped to reduce sensitivity? I really do like this product very much. The toothpaste is very minty. From my understanding, this toothpaste alone cannot whiten teeth once it has been discolored for a long period of time but is good at removing superficial stains which have not set. If you do decide to try Crest 3D, start brushing with a small amount. Everyone’s reaction to this product will be different. If you have any questions, I’ve found Crest 3D’s customer service to be very patient (I had lots of questions for them) and helpful so don’t hesitate to contact them for advice. This entry was posted on Wednesday, July 27th, 2011 at 8:28 pm	and is filed under teeth whitening, Toiletries. You can follow any responses to this entry through the RSS 2.0 feed. You can leave a response, or trackback from your own site.